Here are the second ones for tonight! As said before, I can post specifications later on. 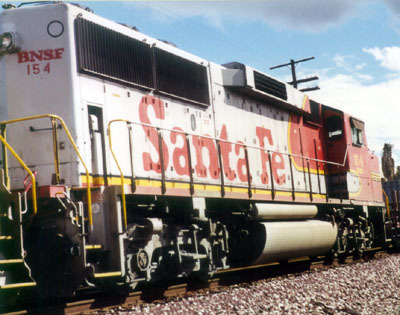 Feel free to discuss / comment any or all of these units [locomotives]. Shot of Me [Scott35] in Cab of Model P-40-8 [AKA "Dash 8"] at the right hand side control panel - the traditional Engineer's side. 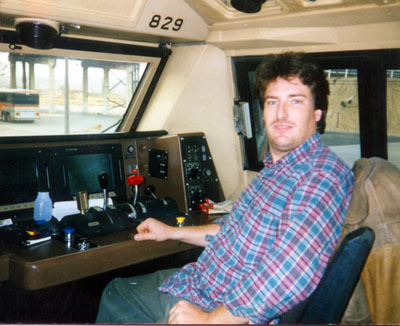 Taken at ATSF's Barstow Yard circa 1995. 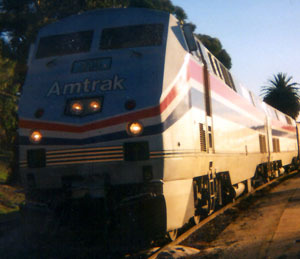 Front right, or Fireman's side view of P-42-8, taken at SP's Paso Robles Yard, circa 1998. This unit is very similar to the P-40-8 "Dash 8" unit, in which I am shown inside the cab [above photo]. 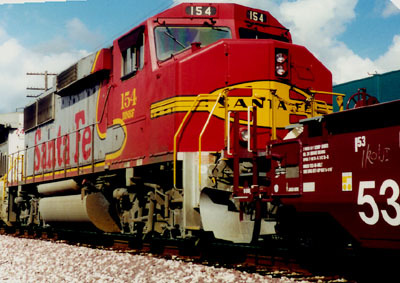 Note: Paint Scheme is "Silver with Red Warbonnet". Posted 10/24/2001 @ 21:03:00 by Scott "SET"
Hey! I'm glad to see that someone else isn't afraid to show their face around here!